Was this THE exotic supercar of the 80s? In terms of mass appeal, I really can’t think of anything that would knock it from the top of the automotive mountain. Lamborghini? Yeah, the Countach was still going strong and it was without question an awesome-looking car, but the design dated from the early 70s, so it’s hard to claim that it “belonged” to the 80s. Lambo’s child that decade was the Jalpa, which was definitely not a ride you saw many people rushing to stick up on their dorm room wall. Maserati? Forget it, the 80s were most distinctly unkind to this marque—the languid, ugly Biturbo was a shamefully tarnished tine on the famous trident for sure. Lotus Esprit? Not bad, but hey, it had a four cylinder engine, just like your degenerate Uncle Ralph’s 1978 Chevy Monza. RUF Porsche 911? Fast as hell for sure, but again, we’re talking about a basic design that had been around for decades at that point. Later in the decade, the Porsche 959 and Ferrari F40 appeared and while they were untouchable in terms of performance, they were almost like one-off freaks in a way. 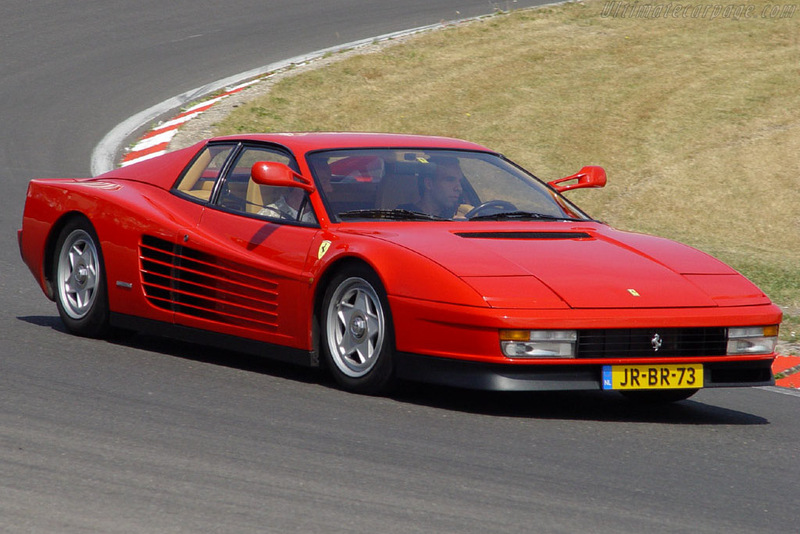 No, it seems to me that as an “everyday” supercar, the Testarossa captured the public’s imagination like no other. Every Friday night, millions of people tuned in to watch a certain Bianco-colored version chase down criminals in Miami. Michael Jackson even owned one, although I’m not sure he had the physical or mental capabilities to actually drive it. And for just one lousy quarter, anybody could sit behind the wheel of one (next to a hot blond, no less) thanks to the Sega arcade game Out Run. What about the red 308 GTS that was driven by Thomas Magnum ? Hottest supercar of the decade, for the very reasons you so eloquently articulated.